Lectures on “Heart Disease in Women” have been integrated into the Hadassah-Hebrew University Medical School curriculum. One lecture has been incorporated into the fourth year “Introduction to Cardiology” segment and another has been added to each of the Cardiology Rotations of six-year students. When nursing students focus on cardiology in their education, they rotate through the Pollin Center. Now a more advanced assessment of heart disease in women has been incorporated into the master’s program in nursing. Partnering with their colleagues in the Hadassah-Hebrew University Braun School of Public Health and Community Medicine, The Pollin Center has initiated a research grant in memory of Linda Joy Pollin to support research that promotes women’s heart health. Linda Joy, daughter of Irene Pollin whose gift brought about the founding of the Pollin Center, passed away at age 16 as a result of a congenital heart condition. 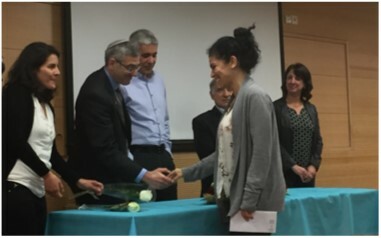 The first recipient of the Linda Joy Pollin award is Sarit Danieli, master of public health student at the Braun School, who will do her research on the needs of the women in the low socioeconomic Pat community of Jerusalem, where Pollin has initiated a health promotion program. The Pollin Center’s mission is to raise awareness among women and health care providers about the risks of heart disease that women face and to empower and encourage women to make life choices that will preserve a healthy heart.